Edgewood Avenue is a street in Atlanta running from Five Points in Downtown Atlanta, eastward through the Old Fourth Ward. The avenue runs in the direction of the Edgewood neighborhood, and stops just short of it in Inman Park. Edgewood Avenue was first important as the route of a streetcar line to Inman Park, Atlanta's first garden suburb and home to many of its most prominent citizens. Today, the avenue is known for its restaurants and nightlife around its intersection with Boulevard. Edgewood Avenue has its origins with the Atlanta & Edgewood Street Railroad Company, originally authorized to run horsecars along Foster Street to what was then the separate village of Edgewood. The company, owned by Joel Hurt, introduced Atlanta's first electric streetcar service in 1889. The streetcar was designed to make Hurt's garden suburb, Inman Park, easily and comfortably accessible. At the time, on the present route of Edgewood Avenue, there existed two streets: Line Street, which ran from Peachtree Street east to Pryor Street, and Foster Street, which ran east from Calhoun (now Piedmont Avenue) due east towards the town of Edgewood. In between were 94 houses and lots. In order to provide a direct rout for the railway, Hurt's East Atlanta Land Company demolished the dwellings, built the missing road, and improved the entire avenue, rechristening it with its present name. After decades of neglect, the part of the avenue located in the Old Fourth Ward has become a bar and restaurant district, home to a number of Atlanta's most eclectic nightspots. These include Sister Louisa's Church of the Living Room and Ping Pong Emporium a.k.a. simply Church, Corner Tavern, Noni's, Circa and the Sound Table, which was recognized as one of the 50 Best Bars in America by Food & Wine magazine. Bar and restaurant-owners are attracted to Edgewood's "non-corporate" feel, mostly due to its urban layout and historic buildings showcasing turn-of-the-century architecture. This all showing another period of growth and maturity for the corridor, since 2013 when Edgewood Avenue around Boulevard had been perceived by some as a site of "drug traffic, petty crime, and homeless hideaways". As of 2014[update], more eating and drinking establishments are opening, such as Bad Dog Taqueria, the Music Room, and Panbury’s Double Crust Pies, as owners seek to capitalize on improved access to the area, particularly to tourists from downtown, via the Atlanta Streetcar, which will start service in late 2014. In 2013, Creative Loafing editor Cliff Bostock called Edgewood Avenue "the most 'diverse' party and dining area in the city ... I'm talking age, sexual orientation, and lifestyle, as much as race." In April 2014, Atlanta magazine noted that the avenue had become "a foodie hangout", and only "recently". The article quoted Keiran Neely, co-owner of Pizzeria Vesuvius and the Music Room, as saying: "Edgewood Avenue has begun to explode based on the streetcar ... It seems like every week there’s a new restaurant or bar." Since late 2014 the Atlanta Streetcar has operated service along Edgewood Avenue eastbound from Park Place NE to Jackson St. NE, connecting the Centennial Olympic Park area in Downtown Atlanta to Sweet Auburn and the Martin Luther King, Jr., National Historic Site. At each end, Edgewood Avenue is served by MARTA trains, at Five Points and Inman Park/Reynoldstown stations. From 2013 to 2014, the Edgewood Avenue Bridge over the BeltLine trail was demolished and replaced, costing US$4.5 million. Source: Google (2014-08-21). 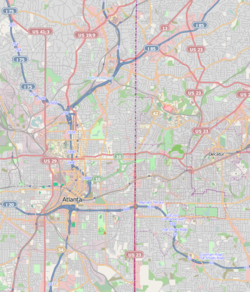 ""Edgewood Ave SE, Atlanta, GA, USA" (Map). Google Maps. Google. Retrieved 2014-08-21. Downtown Atlanta Peachtree St., Marietta St., Decatur St. Five Points. Woodruff Park. 25 Park Place. Park Place Atlanta Streetcar eastbound enters Edgewood Ave. Hurt Building. Peachtree Center Ave. Hurt Park. Hurt Park streetcar stop. Courtland St. Dixie Coca-Cola Bottling Company Plant at #125. Georgia State University buildings. MLK Preservation District begins, ends at Downtown Connector. Jesse Hill Dr. Sweet Auburn Curb Market and streetcar stop. Hilliard St. MLK Preservation District begins again, ends at Jackson. Hilliard streetcar stop. ^ Google (2014-08-14). ""Directions: Edgewood Ave NE & Hurt St NE, Atlanta, GA, USA to Edgewood, Atlanta, GA, USA" (Map). Google Maps. Google. Retrieved 2014-08-14. ^ a b c Garrett, Franklin M. (2011). Atlanta and Environs: A Chronicle of Its People and Events, 1880s–1930s (Reissue ed.). University of Georgia Press. p. 188. ISBN 0820339040. ^ a b c Bostock, Cliff (August 29 – September 4, 2013). "Grazing on Edgewood Avenue". Creative Loafing. 42 (18). ^ Tankersley, Matthew. "Atlanta and Edgewood Street Railroad Company". Atlanta's Streetcars of the Nineteenth Century. Archived from the original on October 10, 2009. Retrieved August 21, 2014. ^ Johnston, J. (1887). Acts Passed by the General Assembly of Georgia. Government of Georgia. p. 162. ^ "Best Bars in America". Food & Wine. Time Inc. December 12, 2013. p. 22. Retrieved August 21, 2014. ^ Henry, Scott (March 10–16, 2010). "Atlanta nightlife gold". Creative Loafing. 38 (45). ^ a b c Cooper, Carly (April 30, 2014). "Revitalization of Edgewood Avenue brings new restaurants, bars to the area". Atlanta. Emmis Publishing. Archived from the original on August 21, 2014. Retrieved August 21, 2014. ^ Turner, Kimberly (August 18, 2014). "Streetcar Test Delights Onlookers and Edgewood Businesses". Curbed. Vox Media. Retrieved August 21, 2014. ^ "Inman Park / Reynoldstown Station". MARTA. Archived from the original on October 5, 2014. Retrieved September 9, 2014. ^ Wheatley, Thomas (April 3, 2013). "Edgewood Avenue bridge is falling down, falling down, falling down". Creative Loafing. Retrieved August 21, 2014. ^ "Edgewood Avenue Bridge Replacement Project". Atlanta BeltLine. July 31, 2014. Retrieved August 21, 2014. This page was last edited on 17 September 2017, at 09:44 (UTC).